North of Eight officially welcomes its newest member, Catherine Smith! We are thrilled to finally be able to publicly announce Catherine Smith as our newest ensemble member. Cathy has already worked with North of Eight on both of our 2018 productions, helping with Front of House on Philtrum and assistant producing Strata, Inc. You might have noticed her running our Insta page, and just generally blessing us with her brilliant positive attitude. While juggling all of this Catherine has been studying Journalism, majoring in politics. 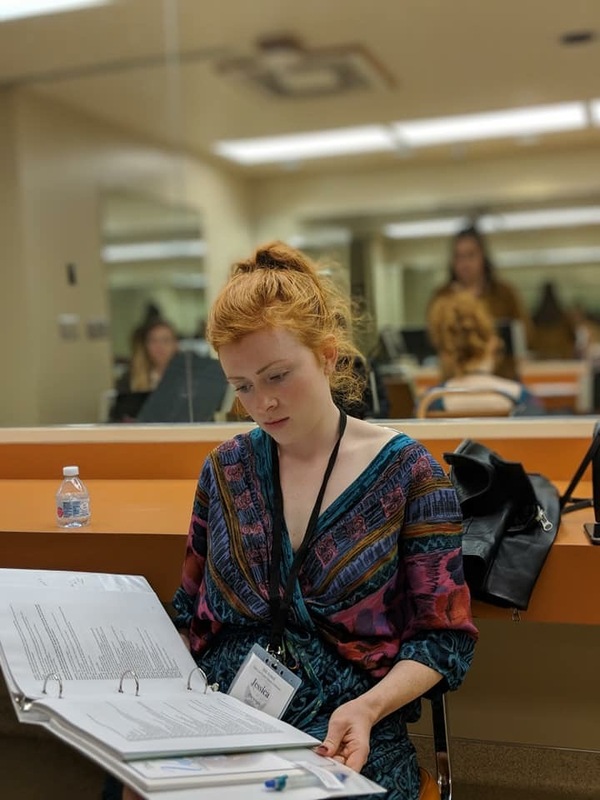 She recently returned from living in Milan, where she studied Commedia dell’arte with the Piccolo Teatro of Milan.Catherine is proud to have been invited to join the North of Eight ensemble this year, and is looking forward to working with such a talented company. Many congratulations to Jessica Stanley who booked Complete Works Theatre Tour playing Dr. Piper Ross, a zoologist on secondment from the San Diego Zoo for the Extinction 2019 In-School Season. This fantastic Australian play by Hannie Rayson address issues around endangered species, conservation projects and coal mining. Jess is looking forward to performing for Year 12 students across Victoria. 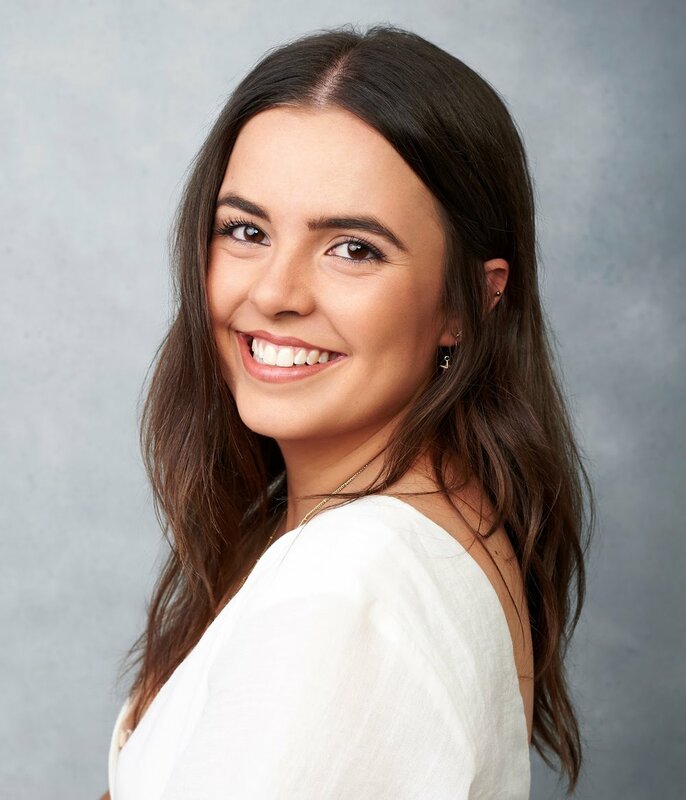 Congratulations to Siobhan Connors, who has just been announced as a cast member in Melbourne’s upcoming indie superhero feature, Long Night in Pexington. This film marks the feature length debut of writer/director Matt Williams, and will also star one of North of Eight’s guest actor’s, Scott Major. Filming will be commencing shortly in Melbourne. We’re kicking off 2019 by diving straight back onto the stage, and you can see members Jessica Martin and Phoebe Anne Taylor this week only at The Burrow, performing in Low Level Panic, written by Clare McIntyre. The play also stars Gabrielle Sing and is directed by Kotryna Gesait. It’s on for four nights only so don’t miss out! Strata, Inc. closed last night and we are feeling so thankful for another well-received show and season! Peter Green from 3MBS put Strata, Inc. into his top ten shows of the year, and with an original works written by one of own, we couldn’t be more proud. Thank you to everyone who supported our 2018 Season: Generation. We can’t wait to see you again next year! We’d like to wish our collective member, Shane Savage, all the best, as today he picks up his life and moves to Vancouver to pursue his dreams. Shane will remain in North of Eight from afar, and we look forward to following along with his travels. Good luck, Shane! Our ensemble has been hard at work on our new show, the world premiere of Strata, Inc., inspired by Aristophanes and his play Lysistrata. We are so excited to be working with a new venue, The Burrow, located on Brunswick Street in the heart of Fitzroy. This independent and flexible venue is run by a team of legends, Pippa and Swiss, and has its own courtyard and bar for our audiences to enjoy. 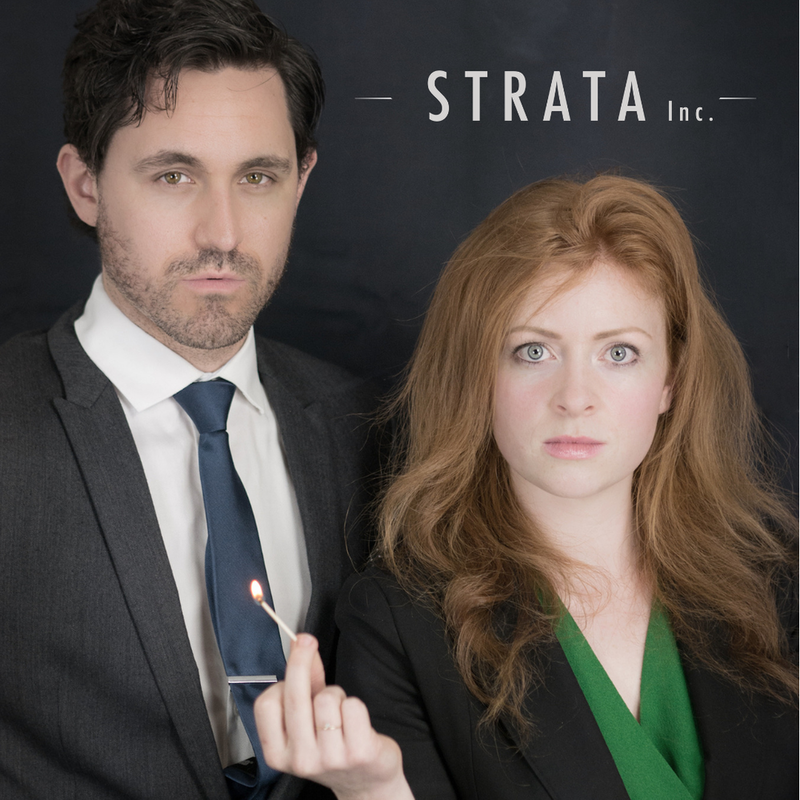 Strata, Inc. has been developed over the course of 2018 by our collective member, Faran Martin, and our guest writer, Laura Lethlean. With collective members cast early in the writing process, it’s been a fun year of workshopping this piece and seeing where it takes us. This play couldn’t be more timely, and we can’t wait to share it with you all. You can read more about the show here. North of Eight is proud to support our Founding Members in their various Melbourne Fringe productions! From left to right, Phoebe Taylor will be performing in Never Ending Night, an immersive underground experience; Jessica Stanley will be performing the solo show that killed in Edinburgh, Ross & Rachel, directed by Faran Martin and assistant directed by Jessica Martin; Sarah Clarke will be performing in Worth, written and directed by Chris Kalandadse. Bye for now, Anthea Greco! Today we said goodbye to our member, Anthea Greco, who is moving to the States to pursue her career in acting and voice over work. Anthea will continue working with North of Eight from afar and we couldn’t be more proud of her. See you soon, Anthea! Philtrum makes the Sunday Age's Guide to the Week Ahead! Following a successful opening weekend, Philtrum gets a mention in The Age. Check out the article here. Philtrum Opening Night sold out! 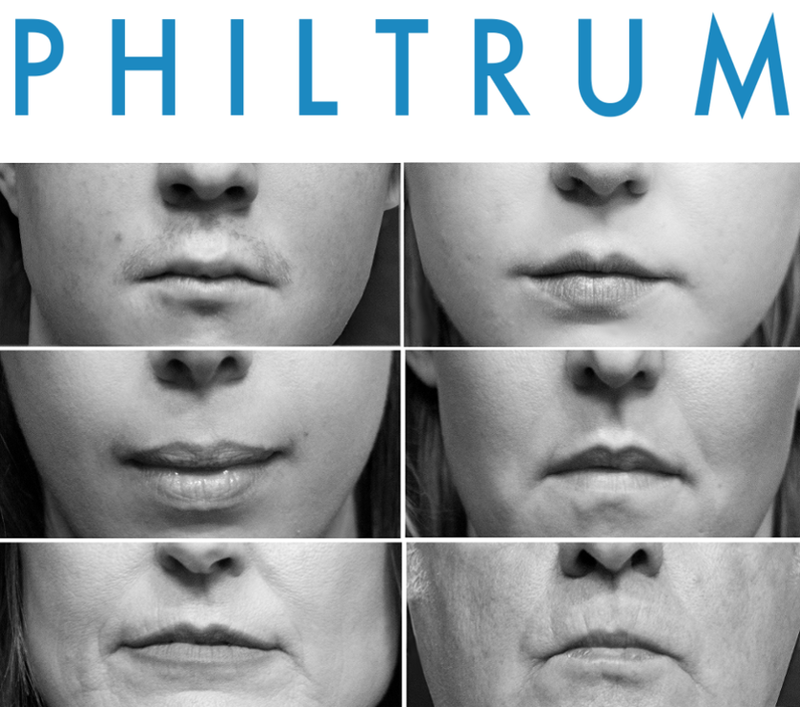 We are delighted to be able to share that our opening night of Philtrum has sold out! Preview audiences loved the show and director Peter Blackburn remarked that he has very rarely seen such strong preview performances in his career. Tickets are on sale now and selling fast - don't miss this World Premiere by one of our Founding Members, Anthea Greco. Book your tickets here. North of Eight delighted to be sponsored by Helen & Joey Estate wines for our 2018 season! Not long now until the theatre bar is open for our first show of the year, Philtrum by Anthea Greco, and audience members can discover why we're so excited to be serving Helen and Joey estate wines. "The unicorn is a mythical creature which has been written about in history across many cultures for thousands of years. Accusations of real sightings have been made many times, only in reality, the sightings were other animals; perhaps seen in the mist from afar, an antelope with only one antler, a stunning white horse disappearing into the forrest. Congratulations to our Chair, Jessica Stanley, who was the only Australian playwright invited to attend the Last Frontier Theatre Conference in Valdez, Alaska, later this year. She will be representing her country with her play Sisters, Inferno, as well as stepping into the acting ring while she’s there. She will be joined by company member James Cerche, also attending as an actor. In 2017, founding member Shane Savage was also invited to the Theatre Conference to perform on the main stage in a production of A Very Modern Marriage by Arthur M. Jolly. North of Eight hopes to continue attending this wonderful conference for many years to come! Among our rigorous planning for our 2018 season, we're delighted to welcome our new ensemble member, James Cerche! WHY ARE YOU PASSIONATE ABOUT STORYTELLING? Storytelling is a courageous and inspiring act. It has the power to fight, mend, break and create ideas about ourselves and the world around us. It is essential practice and a great privilege to engage in. WHAT ARE YOU MOST EXCITED ABOUT WITH NORTH OF EIGHT? North of Eight is a company comprised entirely of friends, most of whom are intelligent and talented women. There’s not a lot more you could hope for in any kind of group. WHAT’S BEEN YOUR FAVOURITE THEATRICAL EXPERIENCE TO DATE? Debuting at Forty-five Downstairs with Goodnight Darlings’ Rainbow Man is one of my proudest and fondest achievements. Again, this comes down to working with talented friends who have the courage to think differently and take risks. 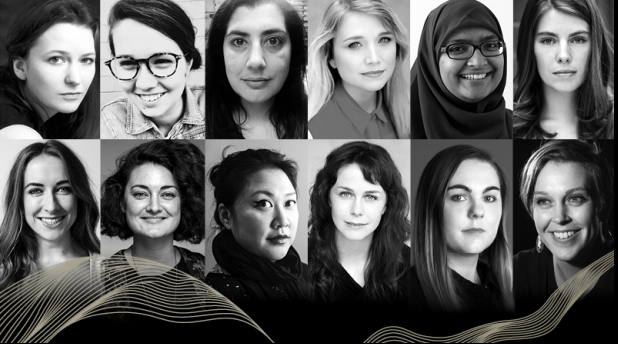 We are thrilled to share that our Founding member, Siobhan Connors, has been selected to be part of Melbourne Theatre Company‘s ‘Women In Theatre Program’. Congratulations Siobhan! As a relatively new independent company, we have been inspired and wish to acknowledge the public stand being taken by our fellow independents over the past week. As we take stock of our first year of creating theatre, we are grateful to find ourselves surrounded by companies and individuals who are not afraid to demand the best of themselves and their colleagues, and to call out anything less. We acknowledge the power we have to hold ourselves and our collaborators present and in the future to the highest standard of safe and respectful working practices, and to choose carefully where we align our practice. North of Eight is committed to standing against harassment, bullying, sexual harassment and all forms of prejudice in the arts. *Tuesday August 29. Offer also valid at the door for Tuesday’s performance. The Courthouse Hotel North Melbourne. 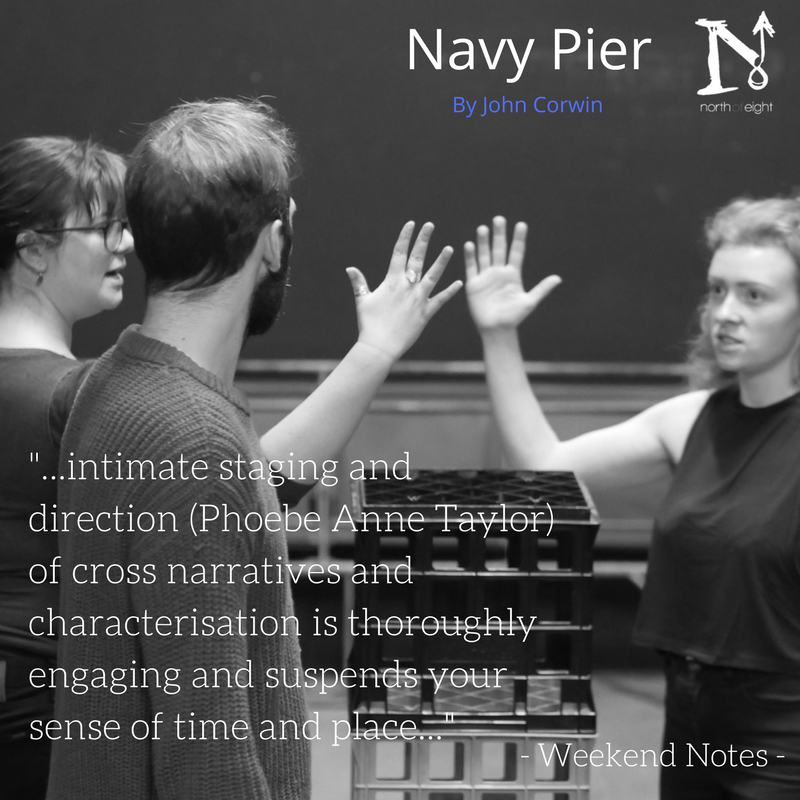 Our first lot of reviews are in for ‘Navy Pier’ with The Plus Ones hailing the production as “…a riveting and intricate tale…” and with “strong directing and acting by theatre company North of Eight that we can recommend without hesitation”. Thank you The Plus Ones! Here what actor and North of Eight Chair, Jessica Stanley, has to say about her experience of playing ‘Iris’ in John Corwin’s NAVY PIER. Sneak peak inside the rehearsal room with the fabulous Phoebe Taylor & Mark Salvestro at work! 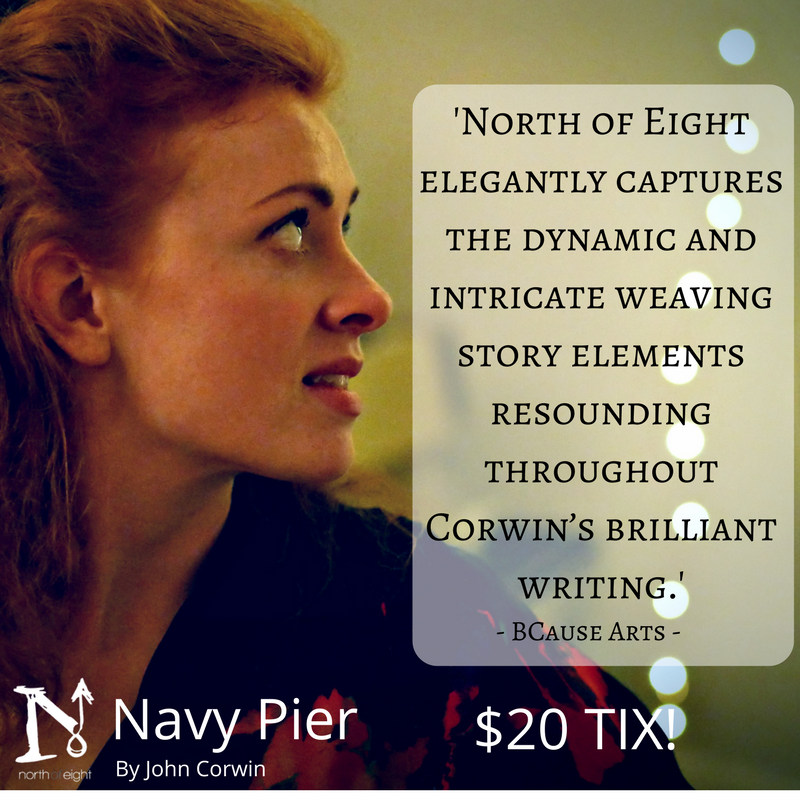 NAVY PIER by John Corwin Opening Night is less than one week away! Have you booked your tickets yet? Pictured: Actor Pat Moonie with Director, Phoebe Anne Taylor. We’d love to introduce our newest member of NoE and Executive Producer, DEAN WORTHINGTON, who has been working away behind the scenes for some months now. WHY ARE YOU SO PASSIONATE ABOUT STORYTELLING? Storytelling allows us as people to connect and share with one another in all of life’s experiences. The sharing of stories is a part of what makes us who we are, whether it be through great theatre, to something much simpler in communicating with our fellow humans. All stories are important and allow us to learn and develop from others’ stories and apply them to our own journey and relationships. I love working with groups where passion and love are the driving forces behind the work. The Collective is one of the most committed and passionate groups of people that I have ever seen, there is such a dedication to the company and the industry as a whole. It is such an honour to work with such talented and passionate people, I just know that we are going to continue to flourish as we continue to produce exceptional work. I’m not sure I could ever distill all the theatre I have seen into one favourite moment. While I was living in London I managed to see some amazing actors treading the boards in the West End, I will never forget seeing James Earl Jones, playing Big Daddy in Cat on a Hot Tin Roof, which just blew me away. But I have also loved experiencing smaller independent pieces which really push the boundaries of what we traditionally know and expect as theatre. To everyone that watched/read about/talked about Toyer by Gardner McKay- thank you! What a ride. We are humbled and incredibly grateful! Thanks The Courthouse Hotel North Melbourne for your hospitality. Thanks Arun Munoz Photography for your photography. Thanks Jaklene Vukasinovic for your assistance and attendance. Thanks Jessica To for coming onboard as our producer. Thanks James Cerche for your poster design. Thanks Nathaniel Morse for your sound design. Thanks Tony Bradshaw for your set construction. Thanks Shane Connor for coming on board as guest director. Thanks Reuben Stone for your lighting design. Thank you to the incredible creative team, Sarah Hallam, Jessica Martin, Anthea Greco, Phoebe Taylor and the entire company. And most importantly, thank you to our fearless actors Faran Martin and Kashmir Sinnamon. You are both inspiring beyond measure. 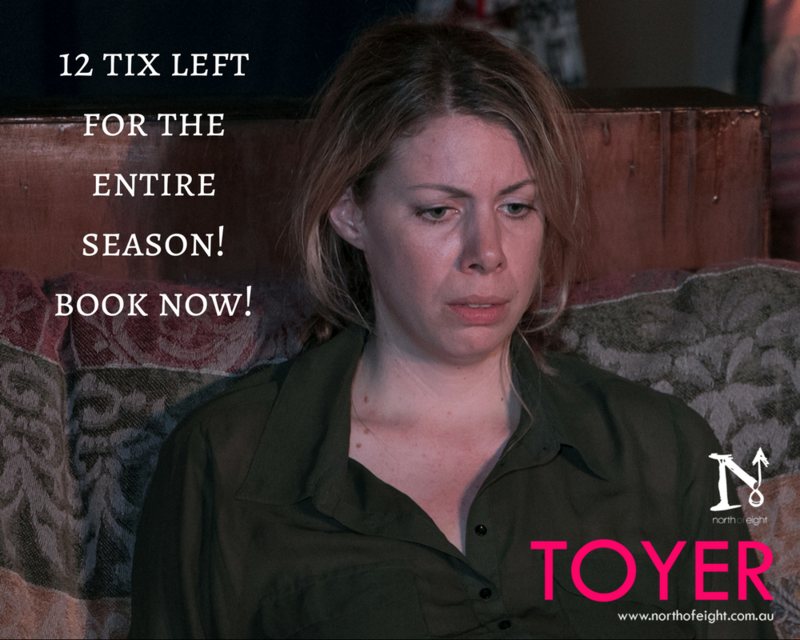 TOYER: 12 tix left for the entire season! We all know that FOMO feeling…turn that frown upside down, and secure your tix for ‘Toyer’ now! Only 12 left for the entire season! Another full house for Toyer – only 2 shows to go! Our fabulous Assistant Director/Stage Manager/Tech Operator, Jessica Martin, sharing a grin with our actors, Kashmir Sinnamon and Faran Martin, following a sold out show last night! Just 2 shows to go – don’t miss out! We couldn’t agree more! Thank you Australian Stage for coming along to review. We’re into week 2 – just 9 performances left! FOCUS ON: Our Supporters, Auspicious Arts Projects Inc. Huge thanks to Auspicious Arts Projects for making our first show possible with their support. Auspicious Arts Projects Inc. was established as a not for profit organisation that would provide artists with a secure and accessible management framework to assist them with creative developments and producing new work. 22 years later, Auspicious has grown to provide financial and administrative management for individual artists, projects, festivals, small companies, community groups and city councils, helping to manage between $5 and $6 million on behalf of Australian artists each year. It is organizations such as Auspicious Arts Projects Inc. who make independent theatre viable and possible and we couldn’t do our work without their invaluable support. Huge thank you to Mr Moto for coming on board for Terminus as our Promotions Partner for the show. We are so very grateful for your support! Established in 1985, Mr. Moto is the most experienced company in Melbourne in promoting the Arts, Events and Entertainment industry. Through poster distribution, flyer distribution, as well as our own digital signage network, we have the ability to showcase your event, theatre or band promotion unlike anyone else. It is due to companies such as this that independent theatre thrives and we couldn’t do what we do without their support. We’ve been so lucky to be able to play out of the award-winning The Courthouse Hotel North Melbourne! Not only are they our venue for Terminus by Mark O’Rowe, but they are also our Major Sponsor and home, so by the end of our 2017 Season you’ll get to NoE the place as well as we do! Thank you to Maggie Journal for the wonderful review! Thank you Stage Whispers for the lovely review! The reviews for Terminus are starting to come in! 150% Funded! First crowdfunding campaign target reached – and surpassed! A HUGE thank you to all our wonderful donors and supporters who made our first crowdfunding campaign so successful! We are so very grateful for your support and belief in the work! Huge thanks also to the Australian Cultural Fund for their support, guidance and help with this campaign. We couldn’t have done it without their expert help and guidance. Can’t make it to Terminus by Mark O’Rowe? That’s okay, you can still get behind the show by donating to our crowdfunding campaign below: https://australianculturalfund.org.au/projects/north-of-eight-presents-terminus/ All donations raised from this campaign will be used directly for Terminus, helping us to cover all costs of the production and produce the best work possible. “Storytelling is intrinsic to the human experience and has been since time immemorial. Whether you consider yourself a Creative or not, you are a storyteller. From a favourite dinner party anecdote to the reason why you are late to work, to putting pen to paper or fingers to keyboard to write a letter, email or blog post, we are all storytellers and all contribute to the wider tapestry of storytelling that is the cornerstone of what it is to be human. Artists are the ones who delve into the human psyche and experience to bring back stories that enlighten, entertain, educate and engage. And there is no more important a time for our voices to be heard. But we can’t do that without the support of others. I would like to acknowledge the Courthouse Hotel for not only sponsoring our launch tonight, but also for including us in the extraordinary line-up of Arts practitioners who also call this place their home. It is people such as Julie and Jason and their businesses such as The Courthouse who are ensuring that independent artists still have a voice – and at a time when it is more important than ever to have those voices heard. Terminus - Opening Night Sold Out! NoE has been busy this holiday season. We’ve just cast our first production for 2017. It is with great delight we can announce the casting for our first production TERMINUS by Mark O’Rowe, Directed by our Co-Artistic Director, Shane Savage. The Play will be opening on February 22nd at The Court House Hotel North Melbourne. What happened at the launch! 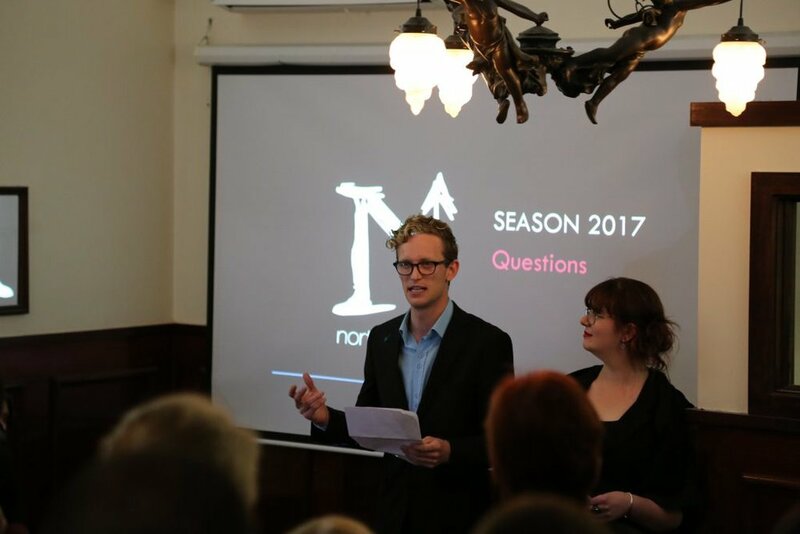 We officially launched North of Eight on Wednesday November 30th, and announced our inaugural 2017 Season. Thank you to the 82 wonderful people who came along to celebrate. It was a truly momentous occasion. The folks at The Courthouse Hotel North Melbourne provided an exceptional space for us to launch in. Thank you Julie, Jason and team. We look forward to making The Courthouse Hotel our home. Also thanks to Lore Burns for playing some beautiful cello music during the evening, and to Jack McTaggart for capturing our special night on film. 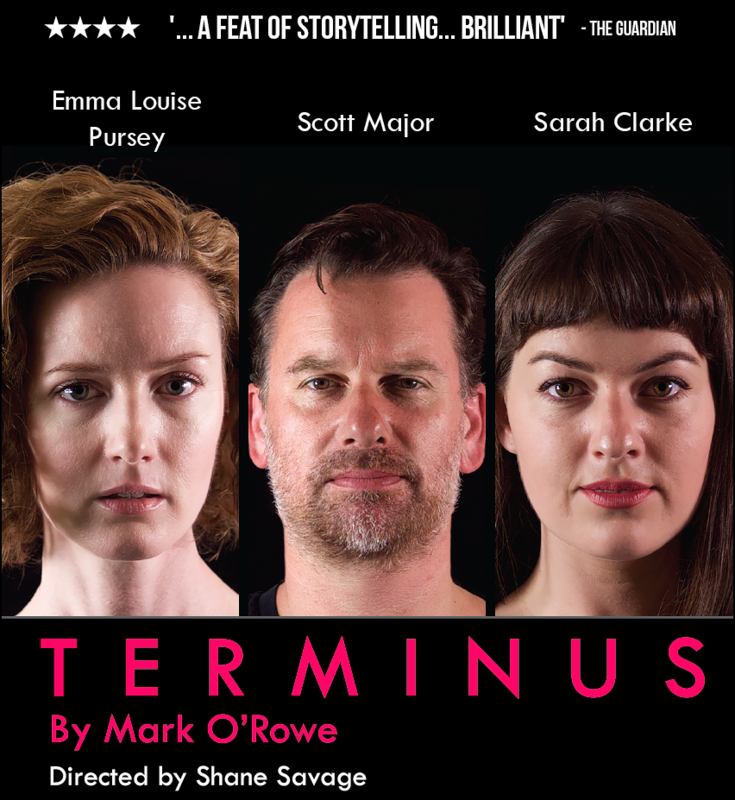 Our first production for 2017 is Terminus by Mark O’Rowe. Will you be joining us for our official Company Launch on November 30? After 11 months of behind-the-scenes work, we can’t wait for you to meet our ensemble and help welcome in our season for 2017.